For the béchamel sauce, heat the milk on the hob, and in a separate pan heat the butter and add the flour, whilst continuously stirring, cooking for 1-2 minutes. Add the heated milk a bit at a time until all incorporated, season, cover with some baking paper or cling film and set aside. Cook the butternut squash in salted water for 2 minutes, remove from the water and refresh in iced water, drain and dry on kitchen paper. Heat the oil in a pan and add the onion and garlic, cook for 1-2 minutes, then add the mushrooms and cook on a high heat for 5-6 minutes, stirring regularly. 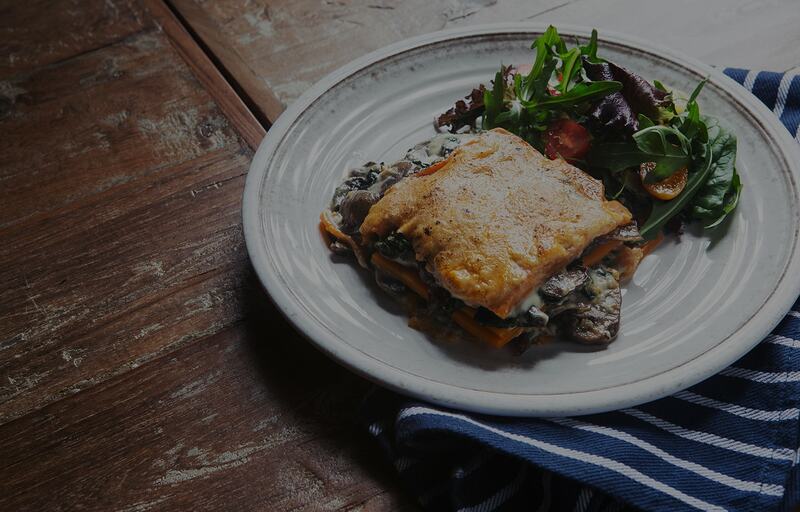 Take the Evolve deep pan plate and layer up the butternut squash slices, mushroom mix and béchamel sauce, making sure to finish with béchamel sauce. Sprinkle some cheese on top. Attach the plate to the Evolve grill; put a piece of baking paper on top of the lasagne and cook at 160ºC for 10-20 minutes until piping hot. Tip- Be careful not to over fill the deep pan plate as when cooking it could over flow. Leave at least ½ cm at the top.